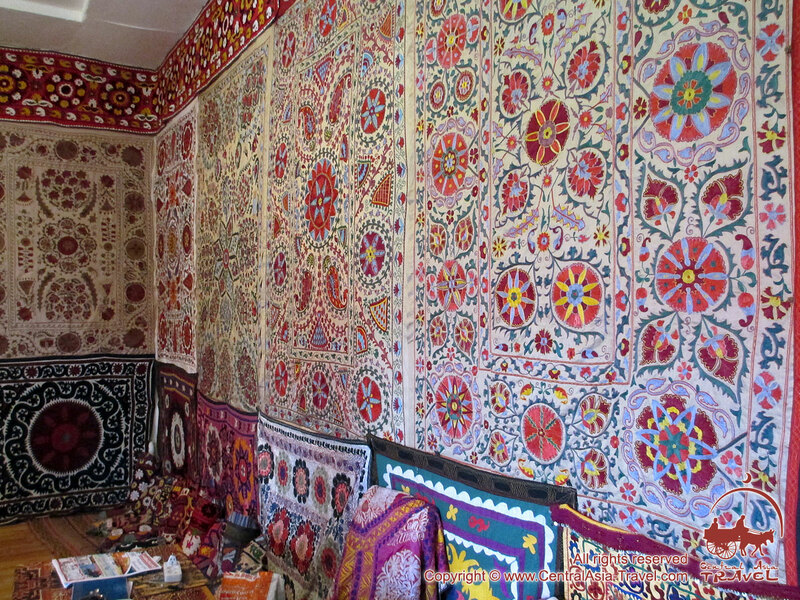 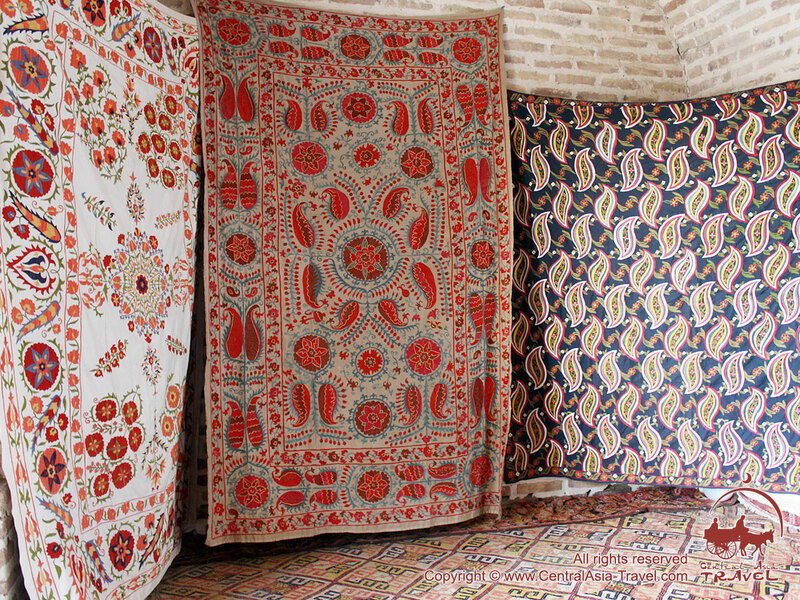 Connoisseurs can easily tell in which province of Uzbekistan and on which occasion a suzani was made. 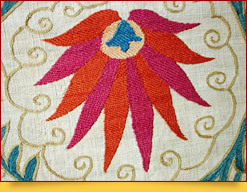 Having a lot in common, the local embroidery schools differ in many respects. 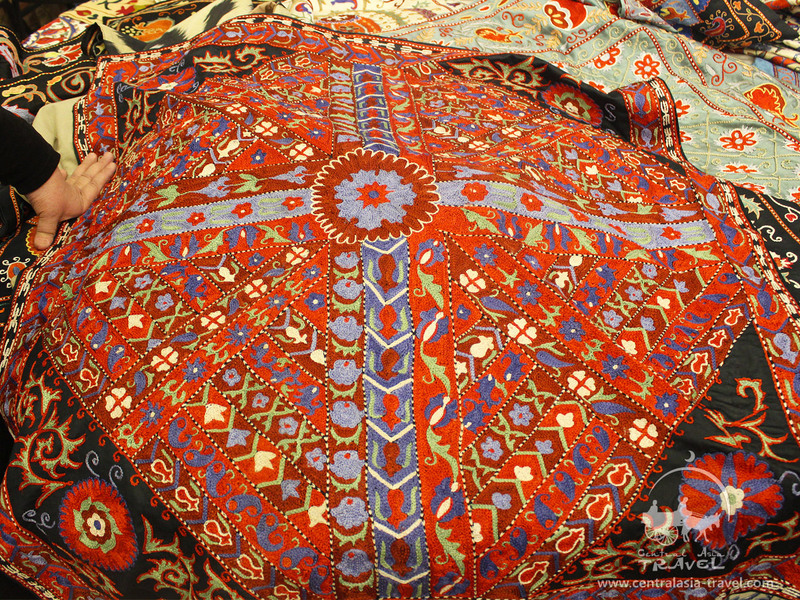 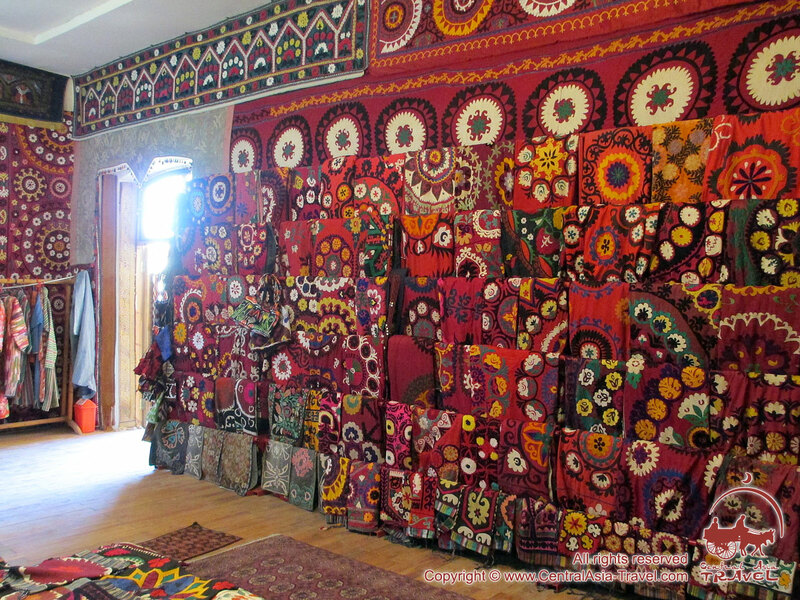 Although general Uzbek suzani patterns are floral, their Bukhara and Ferghana styles, for instance, are hardly similar. 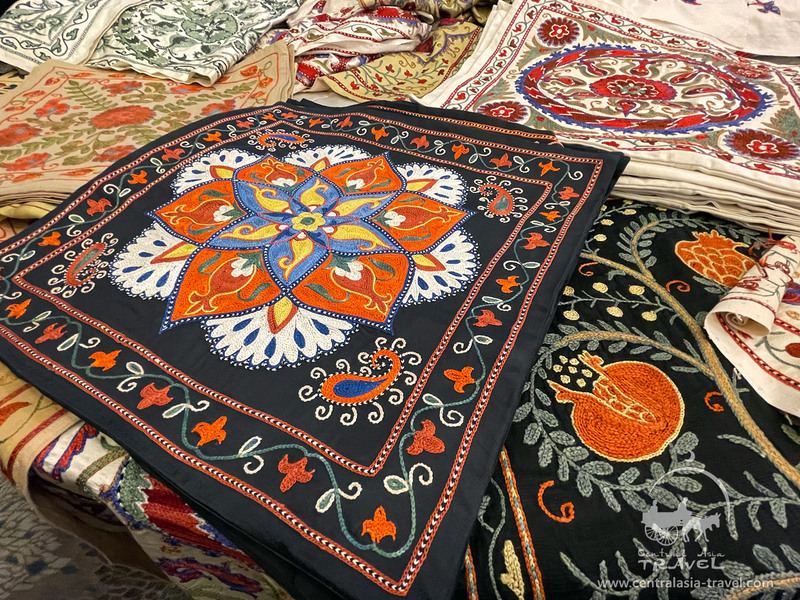 Suzani embroiderers make not only a beautiful tapestry but also a meaningful piece of art expressing happiness, prosperity, fertility, etc through certain colors and shapes. 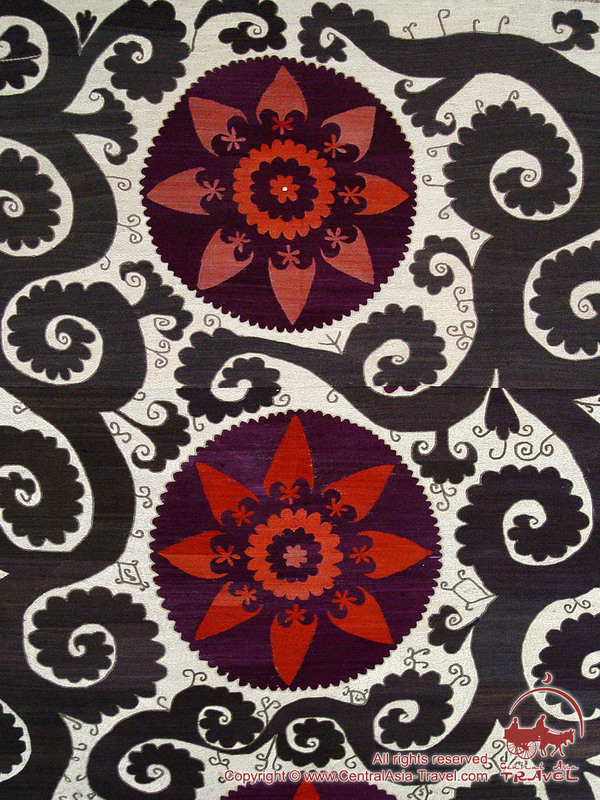 Although there are up to 15 colors and tints used in a suzani embroidery, they always come in harmonious unity. 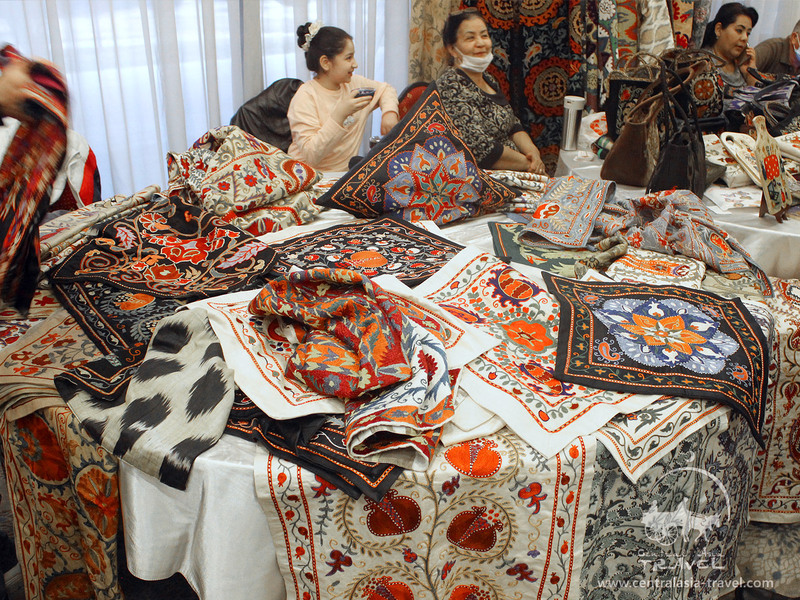 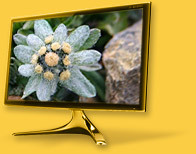 Suzanis made in Nurata are probably the richest in color and variety, and so it is easy to tell them from others. 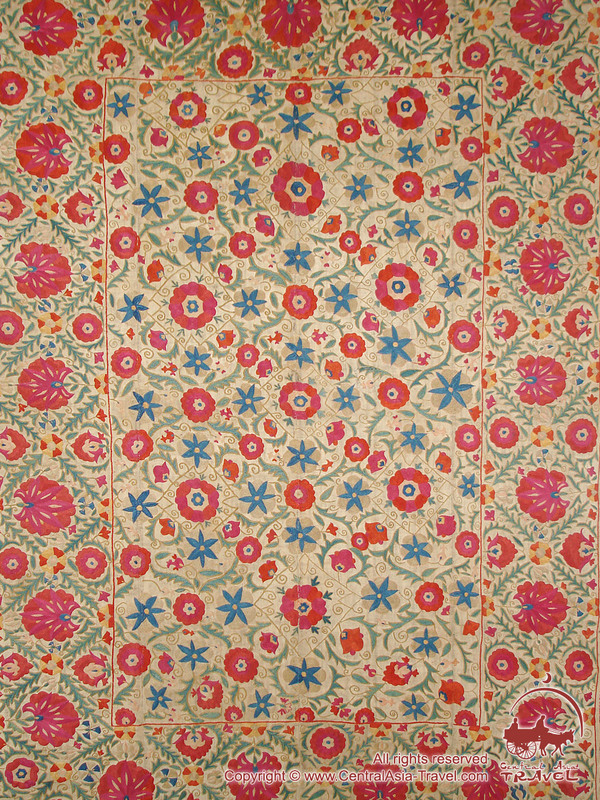 Embroidered on a white background, they represent bunches of flamboyant blue, pink, golden and cream rosettes, and even images of birds and animals - all of them covering the base cloth almost completely. 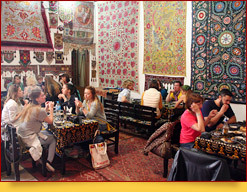 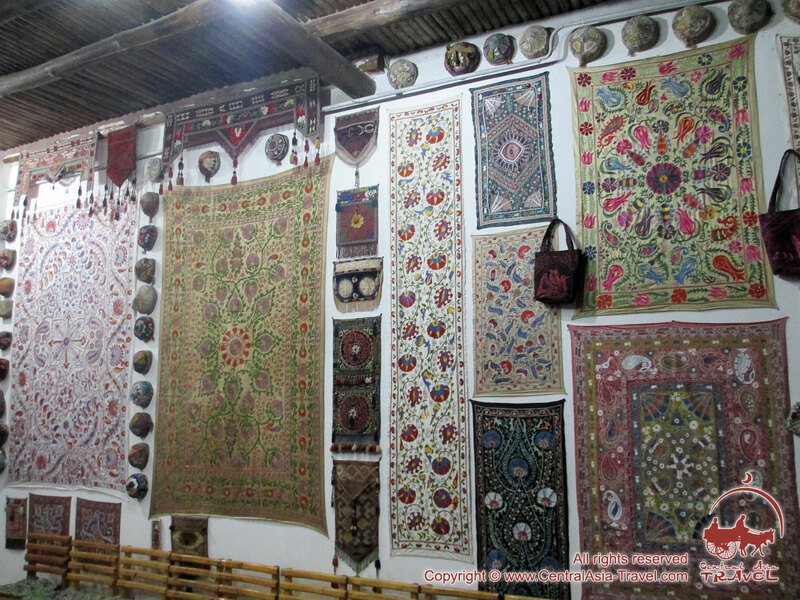 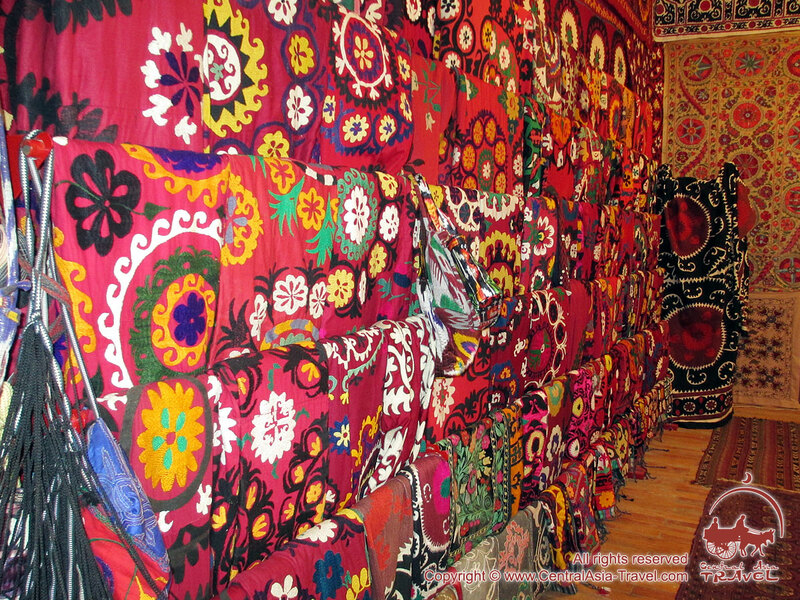 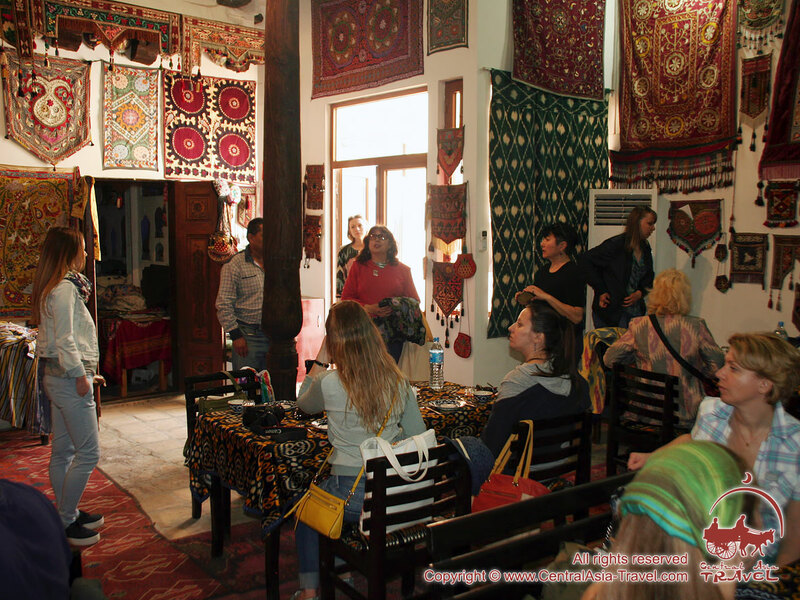 Bukhara suzanis are characterized by chain stitches, a large number of colors - blue, lilac, gray, pink, yellow, red, crimson and green - and plenty of small details connecting larger parts. 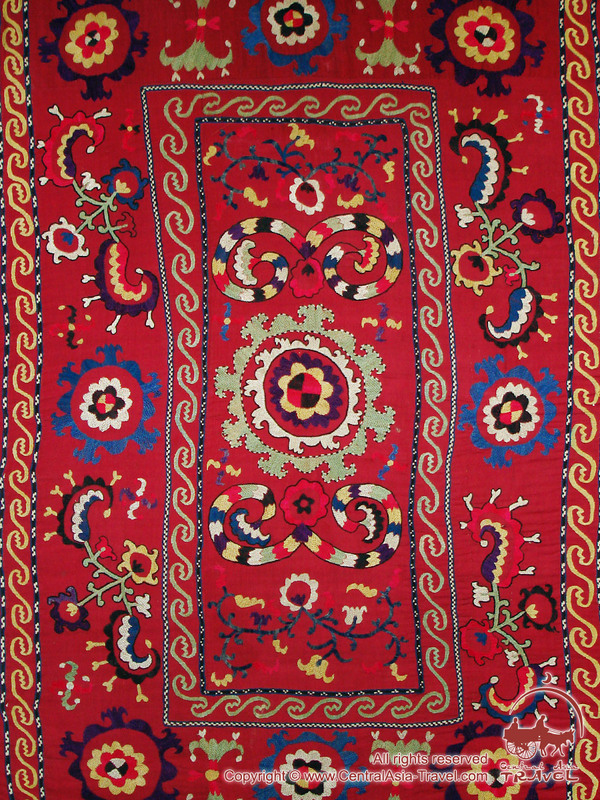 In contrast to Nurata and Bukhara suzanis, Samarkand’s have much larger and simpler designs; as a rule, a Samarkand sizani has a crimson rosette in a leaf ring in the center. 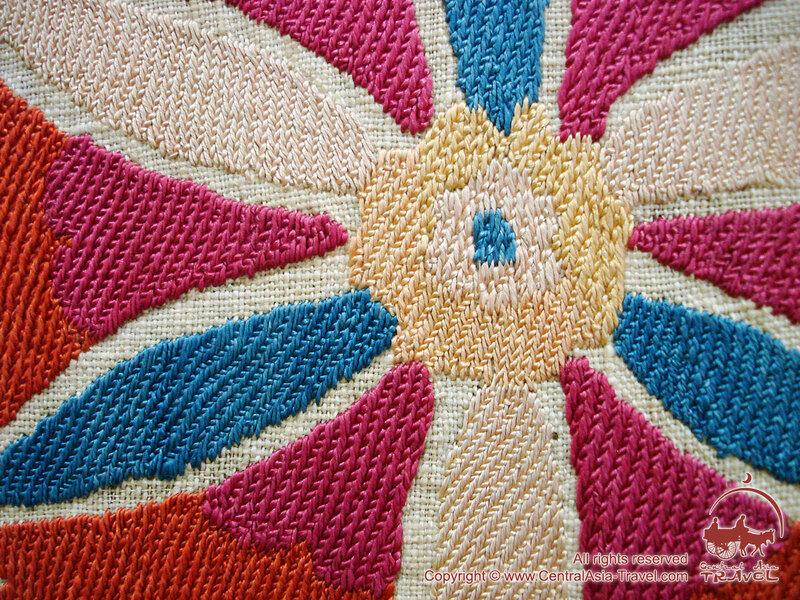 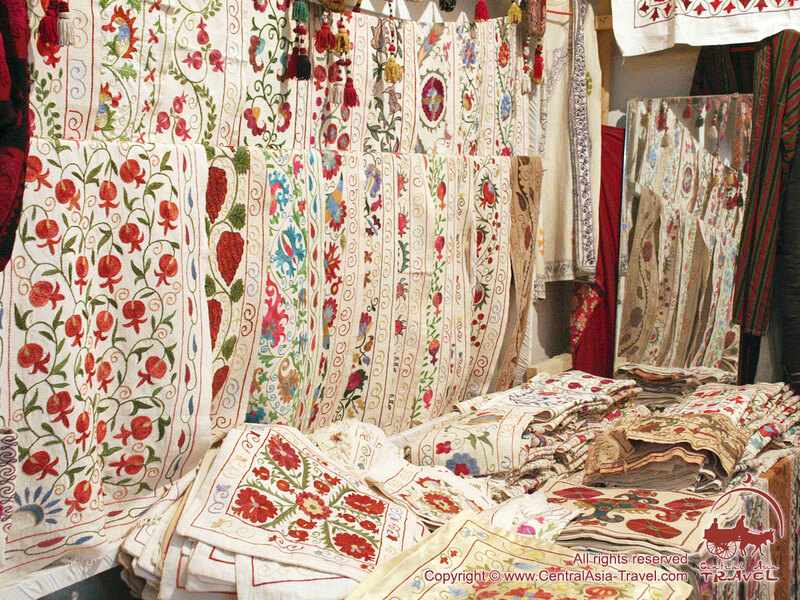 Peculiar to the suzanis made in Urgut (an ancient city in Samarkand Province) is the local stitch bosma; the base materials used are white, yellow or crimson. 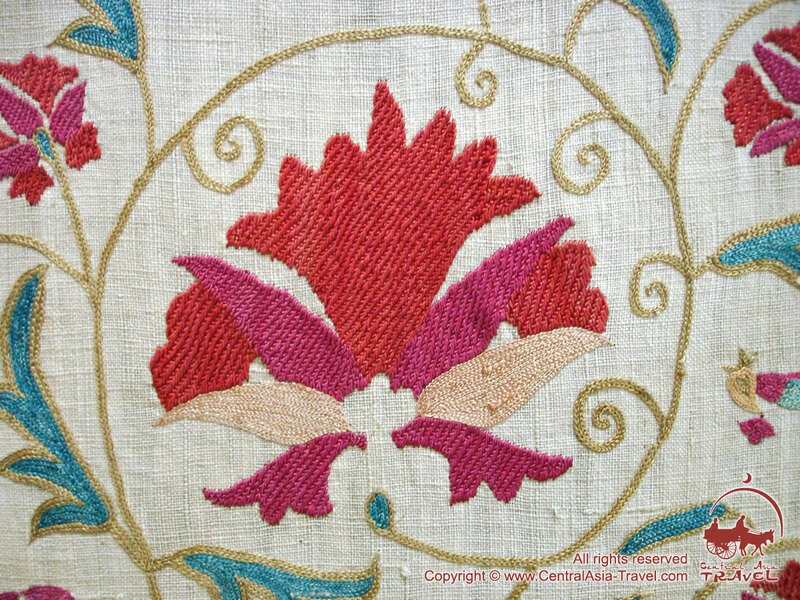 Their thick relief embroideries on a white background are especially impressive. 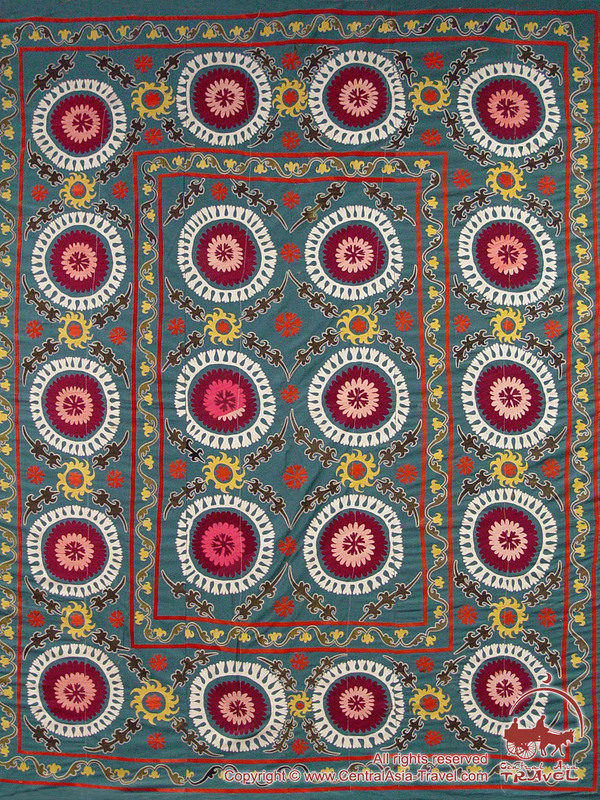 A Shakhrisabz suzani features chain stitch embroideries on a color background, resembling small carpets. 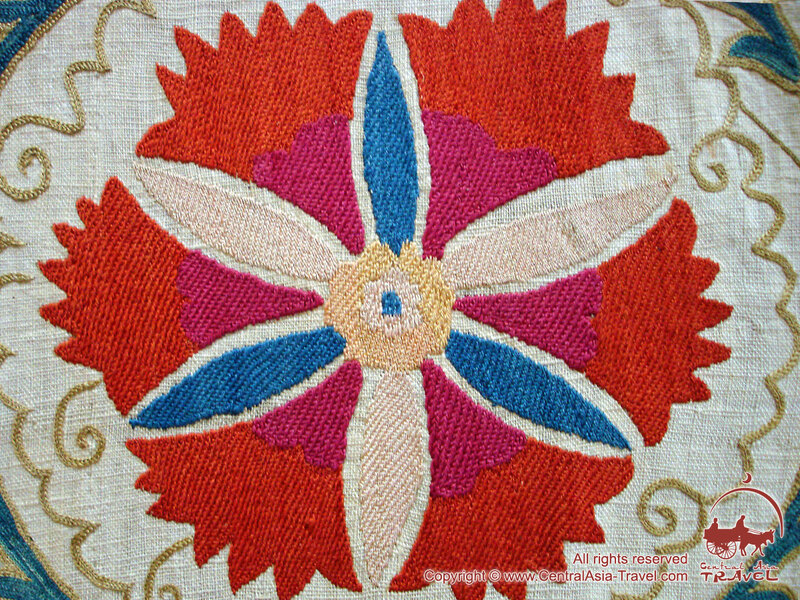 It shows a large medallion in the center, and quarters of this medallion in each of the corners. 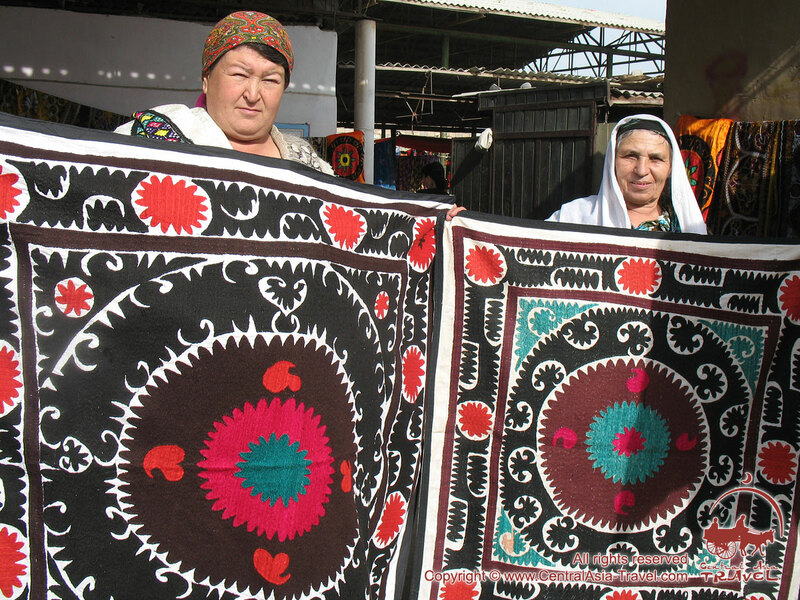 Tashkent suzanis, also as unique, are divided into two styles: palyak and gulkurpa. 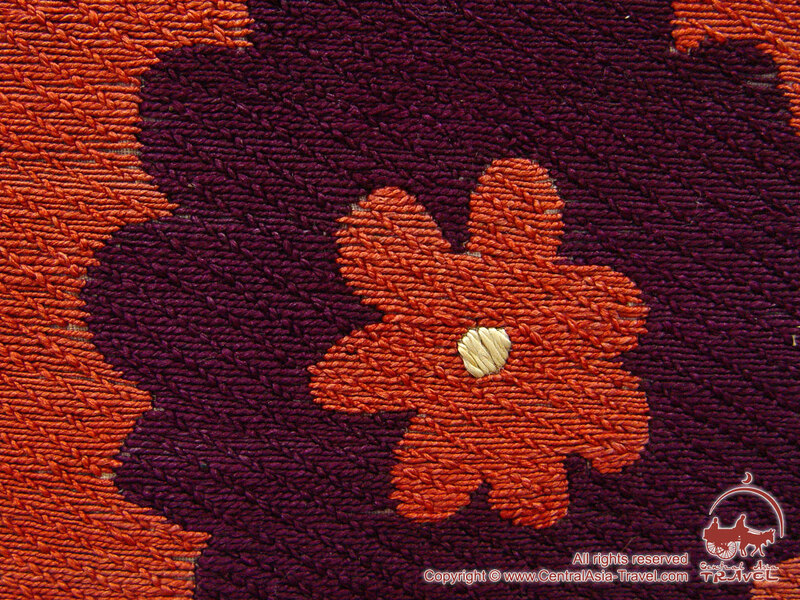 The first features large dark red decorative circles that fill the base cloth densely. 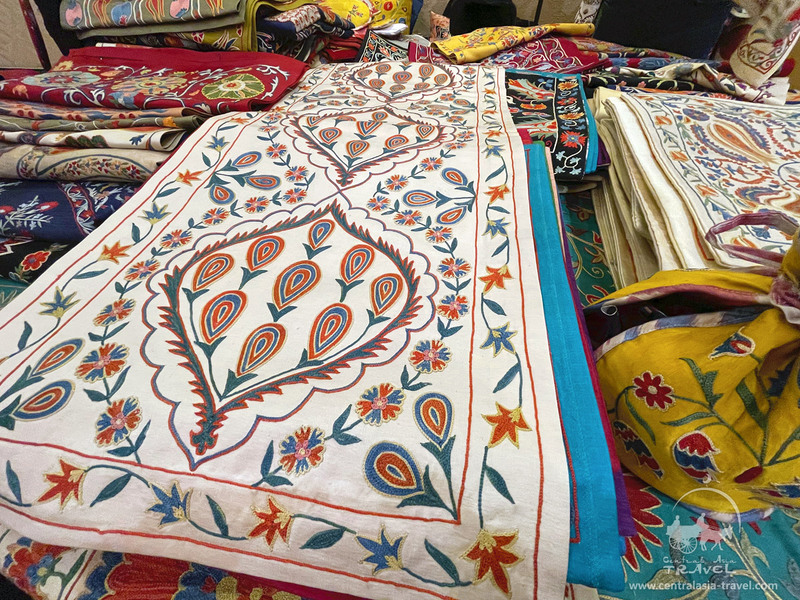 Gulkurpa (‘flower blanket’) serves as a blanket on a wedding bed; its bright floral design symbolizes a happy and large family. 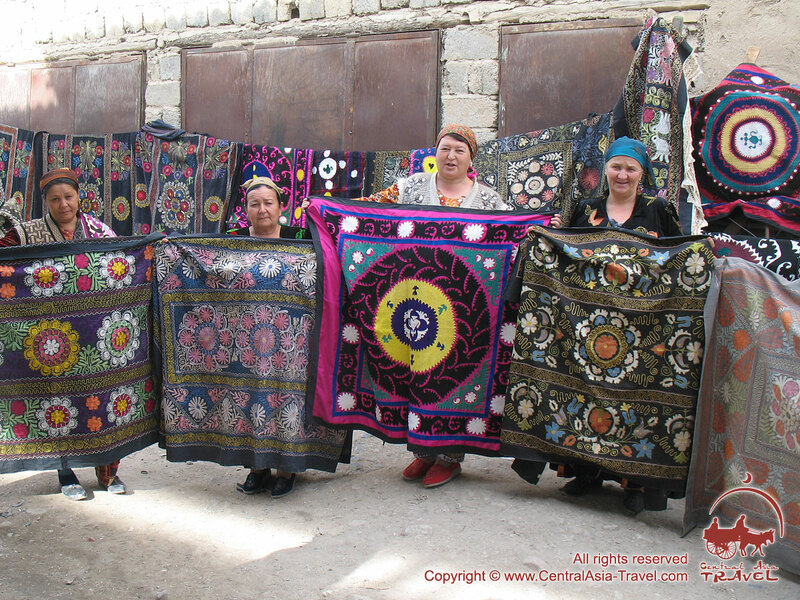 The suzanis made in Ferghana Valley have violet or dark green silk or satin base cloth and light and delicate embroidery designs with no fixed location. 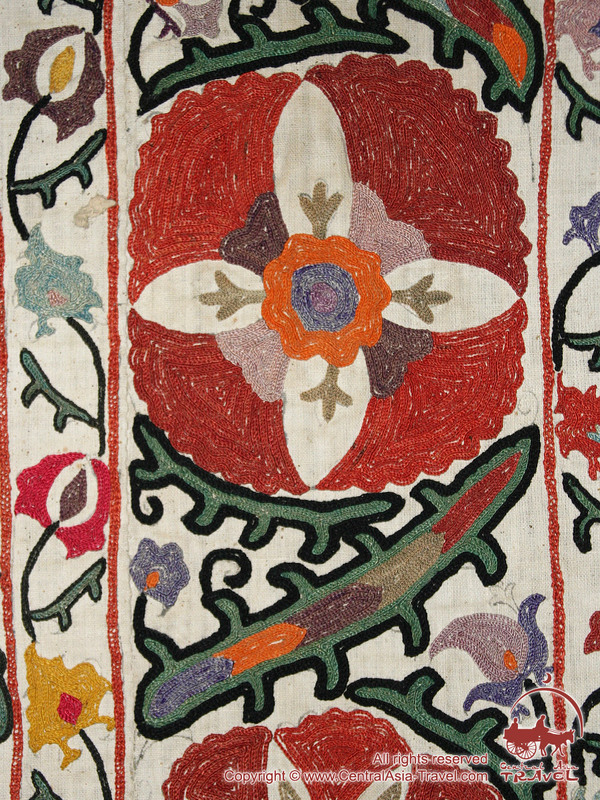 The largest of them are also used to adorn wedding beds. 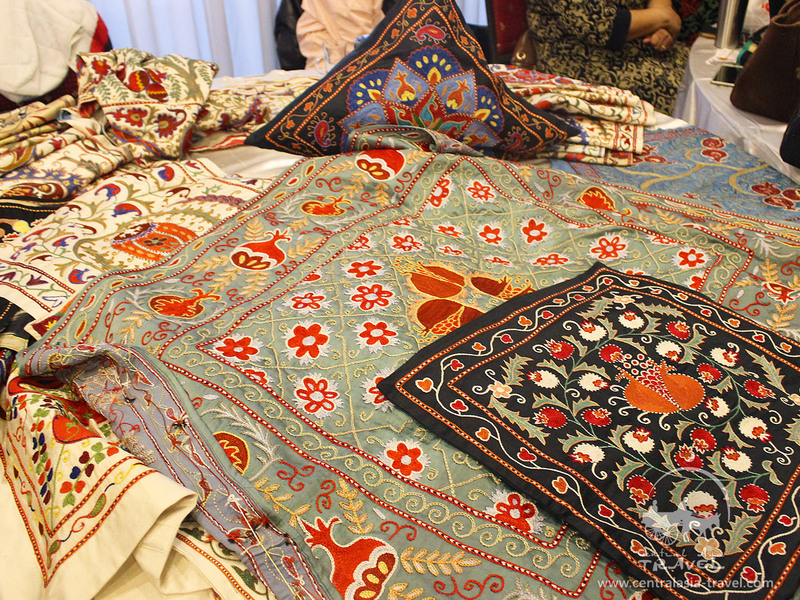 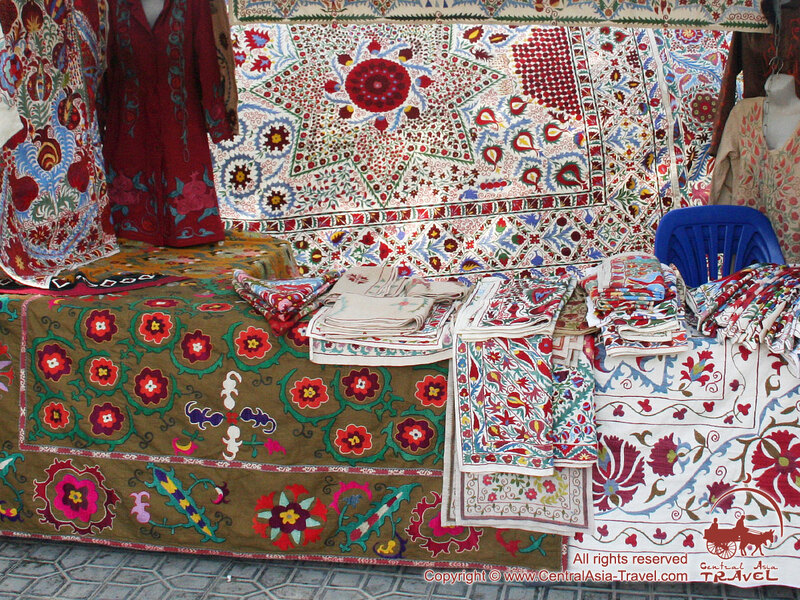 Embroidery, including suzani decoration, is a significant part of Uzbek traditional art. 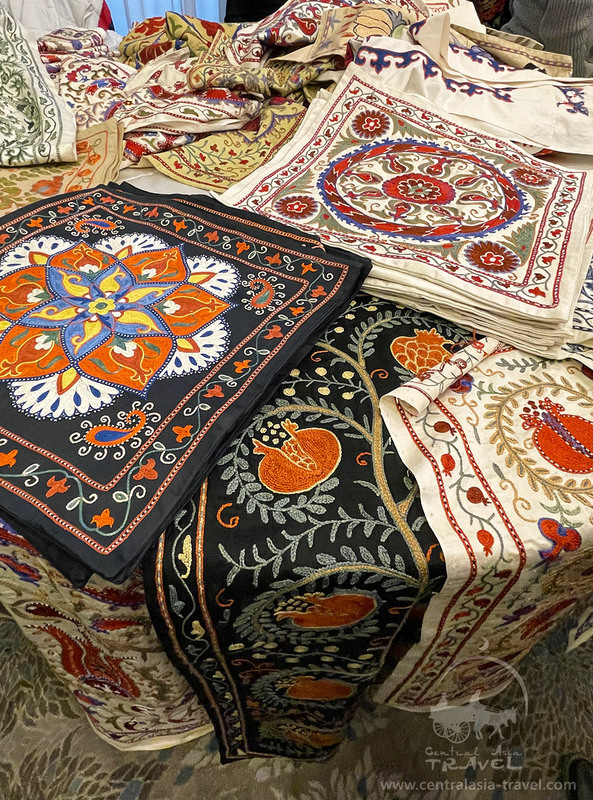 The beauty of Central Asian suzani designs and their ancient symbolism have long been evidence of their makers’ artistry and well-preserved tradition.